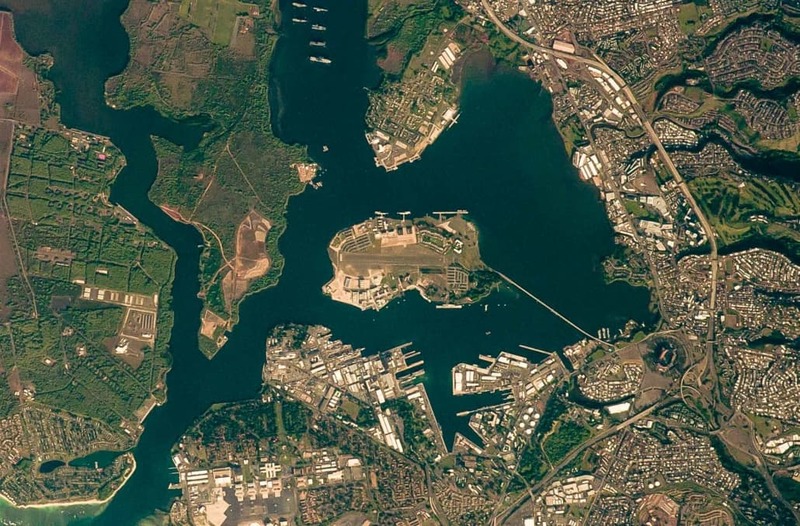 The small islet in the middle of Pearl Harbor is today called Ford Island and is one of the most historically significant sites in America. 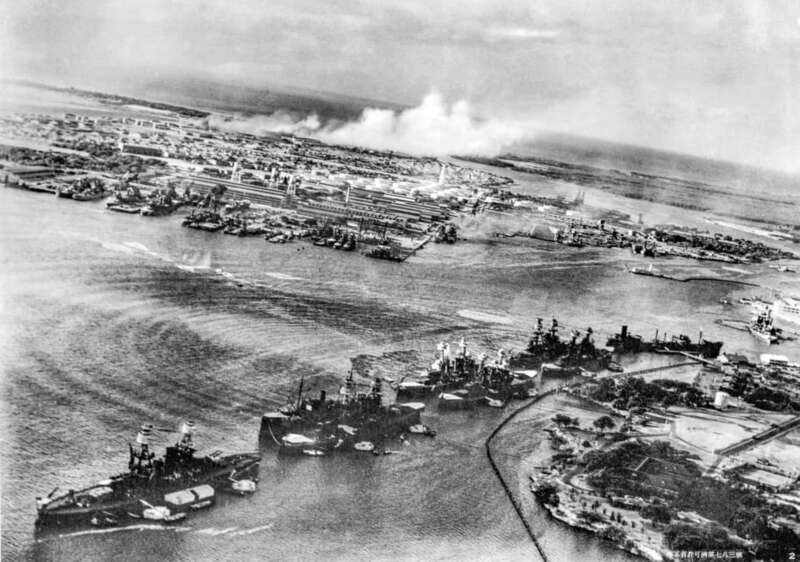 The Japanese attack on December 7th 1941 was centered on Ford Island, home to Battleship Row, as well as many axillary docks and support ships for the U.S. Pacific Fleet. Ford island also had an air strip and aircraft hangars which supported both Navy and Marine aircraft which were heavily damaged during the attack. The attack triggered the United States entry into World War II. Ford Island is about 1.4 miles long and just under 1 mile wide with a surface area of roughly 400 acres. 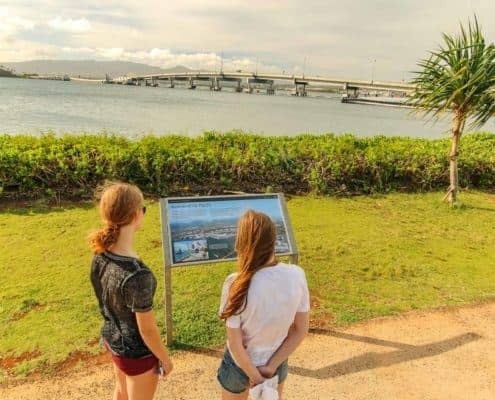 It stands nearly a half mile across the lagoon from the Pearl Harbor Visitor Center and has had several names throughout its history. It is most famously known as the central target for the Japanese attack in 1941 and today houses several important WW2 memorials and museums including the Battleship USS Missouri and the Pearl Harbor Aviation Museum. The ancient Hawaiian name for the islet in the middle of what was then the Pearl River lagoon is Moku’ume’ume. It was the site of an ancient Hawaiian fertility ritual and game of mate swapping. It was also known to be a place where chiefs from the nearby Ewa and Waipio districts held gatherings to discuss politics and social strategies. These are the only known districts in the island chain where ruling ali’i (royalty) were voted for by district chiefs. The lagoon itself was said to be the home of a shark goddess who protected the people from roving sharks who might seek to do harm. After Kamehameha conquered Oahu in 1795 the island became one of several staging grounds for oyster gathering in the search for pearls (the river leading into the lagoon, the Pearl River, had plentiful oysters) which Kamehameha traded for western goods. This is how it came to be called Pearl Harbor. Kamehameha eventually gave the island to one of his foreign friends and advisors, Francisco de Paula Marin, a Spanish explorer, in 1810. “Marin Island” became a ranch of sorts as Marin raised sheep, goats, hogs and rabbits to supply his profitable ship-provisioning business. 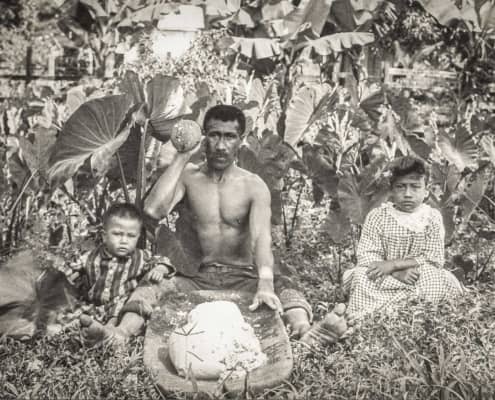 Marin was also known for planting some of Hawaii’s first introduced crops such as pineapple, coffee and grapes. Vineyard street in Honolulu is named for his vineyard and bar located along this street. The island was later given back to the Hawaiian Monarchy and changed ownership several times before becoming the property of Dr Seth Porter Ford by marriage. Dr Ford was a founding member of the Hawaiian Medical Association in 1856 and was renamed “Ford Island”. In 1873 U.S. Major General John M Schofield surveyed Oahu for potential military stations and reported back to the Secretary of War recommending Pearl Harbor be acquired as he believed Ford Island would be excellent as a depot for naval vessels. In 1887 King David Kalakaua granted the U.S. exclusive rights to enter the “Pearl River Harbor” and the U.S. established a coaling and repair station at Ford Island. The U.S. improved the island and harbor in exchange for Hawaiian sugar to enter the U.S. duty free. In 1891 Dr Ford’s son sold the land to the Judge John Papa Li Estate. Papa Li was a native Hawaiian of noble lineage who had served under Kamehameha I,II,III and IV. The island would be converted into a sugar plantation. Kalakaua died in 1891 and within 2 years the Hawaiian Monarchy would be overthrown. The invasion of the Philippines by the U.S. during the 1898 Spanish-American War would use Pearl Harbor as its staging ground for invading the Philippines. This made the harbor an important Naval station in the Pacific for the United States. The establishment of a military foothold in the Pacific and Southeast Asia would lead the U.S. to annex Hawaii by 1900. 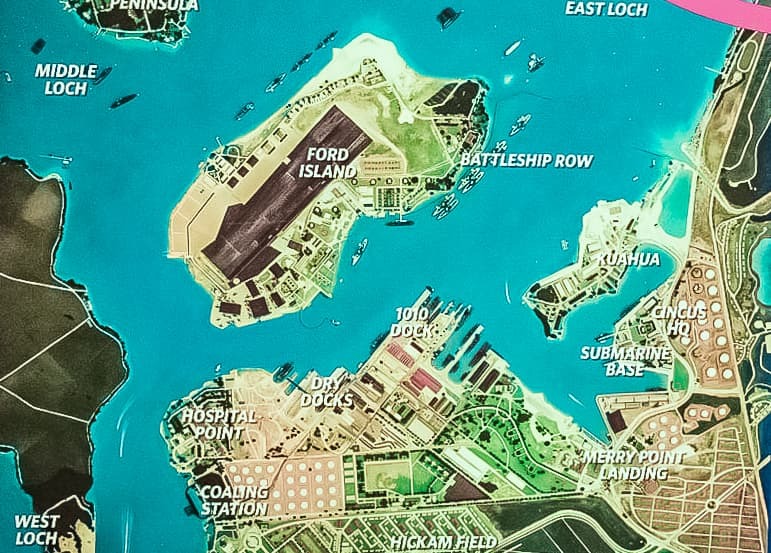 Part of Ford Island was sold to the Army in 1916 for use as its aviation division. The 6th Aero Squadron was created and 49 biplanes would be stationed at a new airfield cleared on the island titled “Luke Field” after WWI fighter pilot ace and Medal of Honor recipient Frank Luke. By 1919 the Army would also erect two seaplane hangars, a warehouse, a machine shop and seaplane ramps. Through the 1920’s and early 1930’s the island would continue to grow as a center of operations for the U.S. Navy. 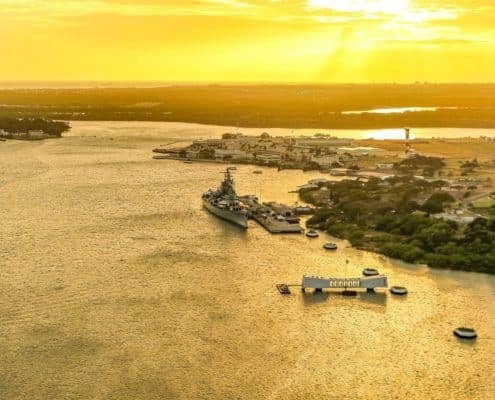 By 1939 the island was entirely taken over by the Navy and became a Naval Station for battleships and submarine maintenance. Officer quarters and housing were also expanded as well as the seaplane facilities and communication installations. Repair and maintenance duties would expand to include aircraft based on ships and aircraft carriers. Ford Island was heavily damaged in the Dec 7th attack in 1941 with the majority of the U.S. Pacific battleship fleet in ruins. The ships ringing Ford Island were the primary targets for over 350 Japanese planes that attacked in two waves that day. All eight of the fleets battleships were damaged or sunk along with four destroyers, three cruisers, an anti aircraft training ship (the battleship USS Utah), one minelayer and several auxiliary ships for a total of 20 vessels damaged or destroyed. 2,403 Americans were killed and 1,178 wounded. Along with the battleships the Japanese also attacked Naval Air Stations throughout Oahu. Aircraft and hangars at Ford Island, Wheeler Field, Hickam Field, Barbers Point and Kaneohe Naval Air Station were strafed and bombed. 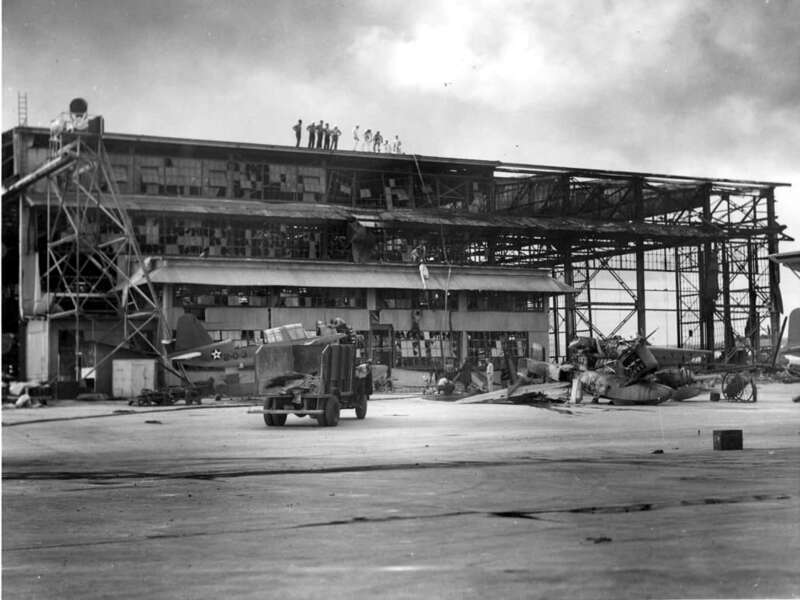 Of the over 400 U.S. aircraft in Hawai’i 188 were destroyed and 159 damaged. 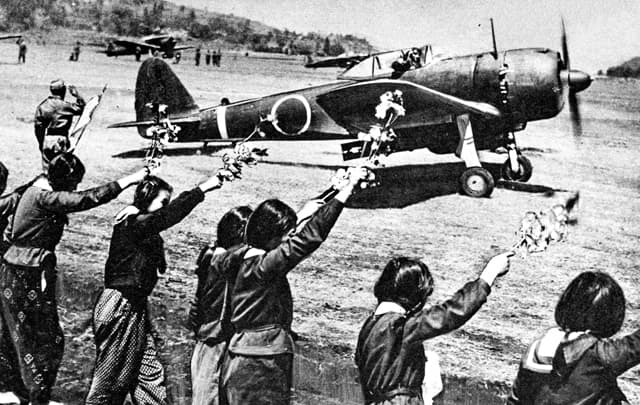 Eight Army pilots managed to get airborne and six were credited with downing at least one Japanese aircraft each during the attack. Nearly all the airfields on Oahu were attacked by the Japanese including the hangars and airfield on Ford Island. 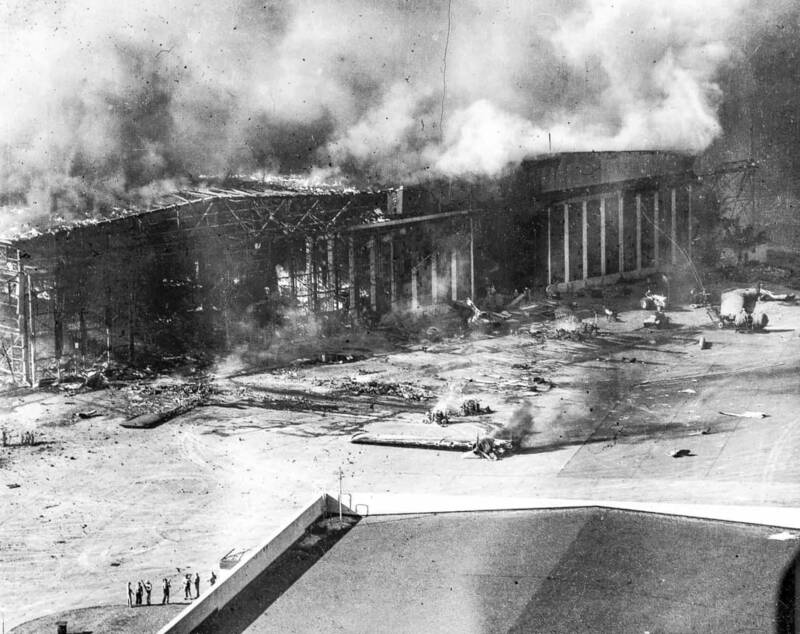 Hangar 37, the seaplane hangar, was bombed and strafed and a bomb meant for the battleship USS California hit hangar 6 on Ford Island setting it ablaze. Additional bombs hit hangar 38, the dispensary courtyard and the road outside the repair and assembly hangar. Only one man on the island was killed during the attack while standing guard. The surprise attack galvanized the American people who up until that time were against entering the war which had been raging in Europe since 1938. The U.S. immediately mobilized its industrial might and manpower to avenge Pearl Harbor. The Naval Station at Pearl Harbor began repairing ships and put several battleships back into service within a few months. 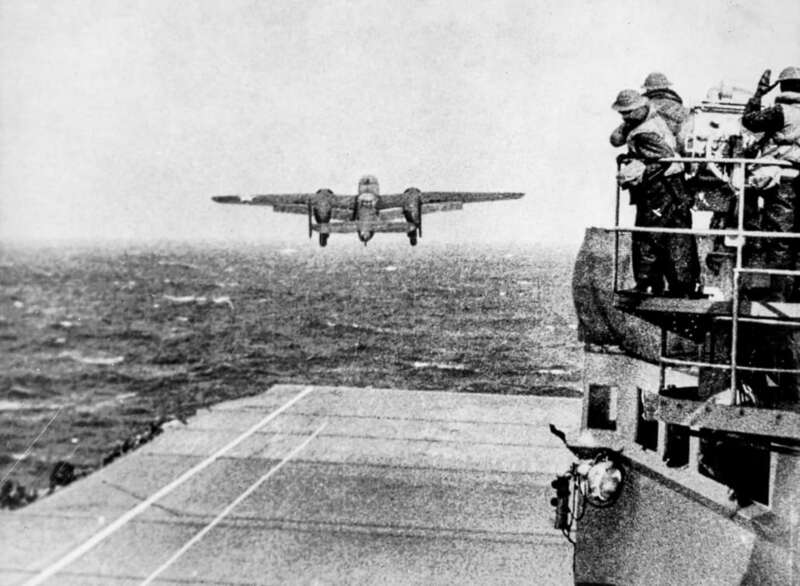 President Franklin Roosevelt called for an attack plan against the Japanese home island which resulted in what became known as the Doolittle Raid. Sixteen B-24 bombers launched from the aircraft carrier Hornet bombed Tokyo 4 months after the Pearl Harbor attack. Though the bombs did minor damage the raid had a huge impact on American moral and shocked the Japanese who recalled troops from southeast Asia to defend the home islands of Japan. In the aftermath of the Japanese attack the U.S. Pacific Fleet was in a very weakened state and would have been vulnerable to another attack had it not been for the aircraft carriers and submarine fleet that were able to take the fight to the enemy. 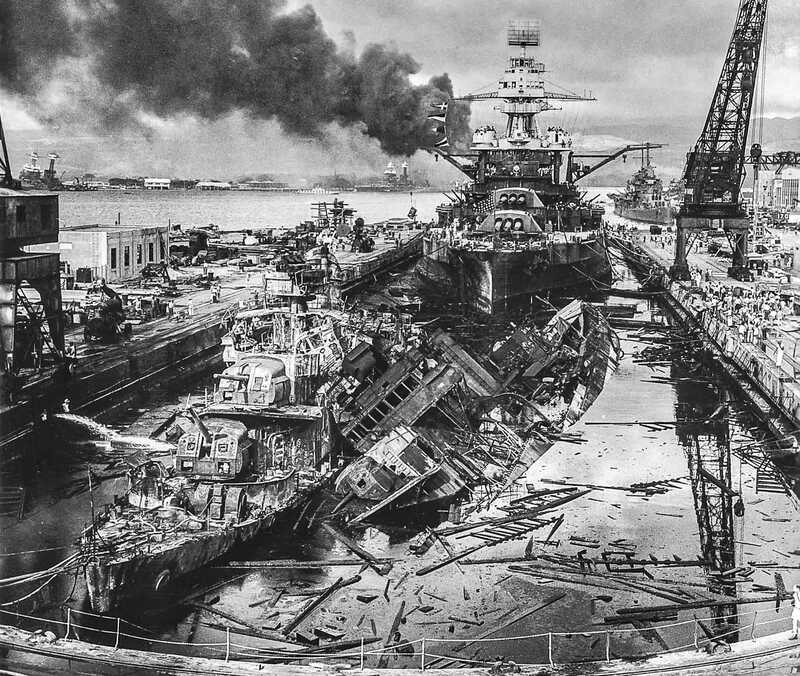 The Pearl Harbor Naval Shipyard accomplished a stunning feat of will and technology: repairing and returning to service six of the eight damaged battleships. All were repaired and put back into service except the USS Oklahoma (which had capsized but was righted yet it was too damaged to refloat) and the USS Arizona. 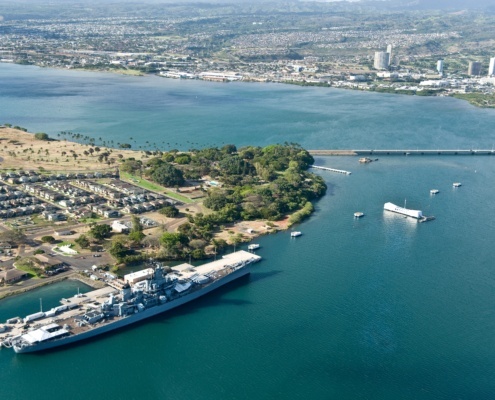 The Arizona still resides at its berth at Ford Island and would eventually become the Arizona Memorial, a tribute to the 1104 sailors entombed on the ship. From 1942 to 1945 the Pacific Theater of War would become some of the bloodiest confrontations of World War 2. 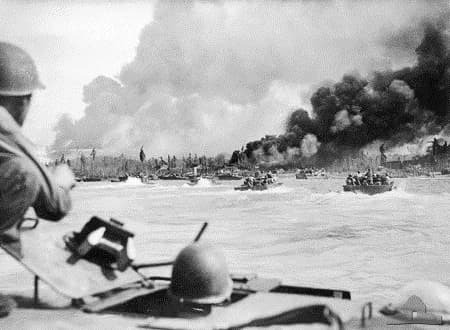 The Japanese would come up against the Allied Forces of the U.S. Navy, Marines and Army including forces of the United Kingdom, New Zealand, Australia and Canada. Admiral Chester Nimitz was appointed Supreme Naval Allied Commander in the Pacific in conjunction with General Douglas MacArthur’s Army and Marine units. The Americans would invade or destroy strategic Japanese bases in the south Pacific with the intent of getting close to the Japanese main islands in order to launch massive air attacks, impose submarine blockades and eventually invade Japan. By the time they reached the home islands of Iwo Jima and Okinawa the Japanese had resorted to kamikaze attacks. 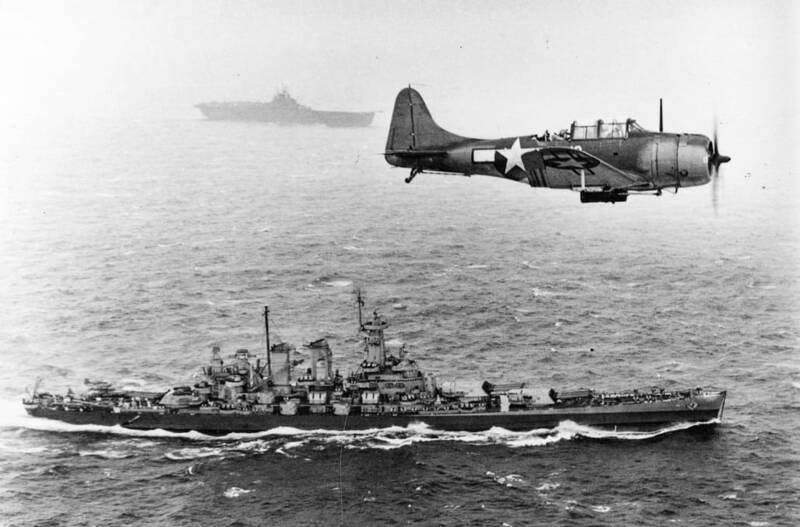 The exact toll of U.S. losses during kamikaze attacks is debatable but most scholars agree that approximately 2,800 kamikaze attackers sunk 34 Navy ships and damaged 368, killing some 4,900 Americans and wounding over 4,800. 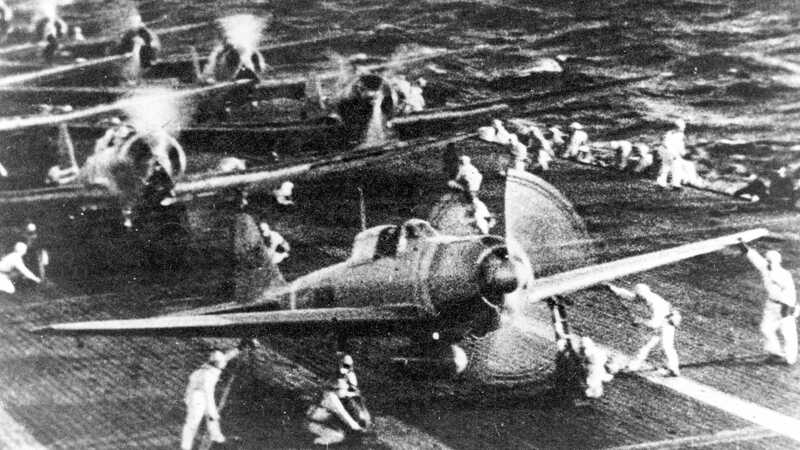 Only 14% of kamikazes scored hits and nearly 8.5% of all ships hit by kamikaze sank. 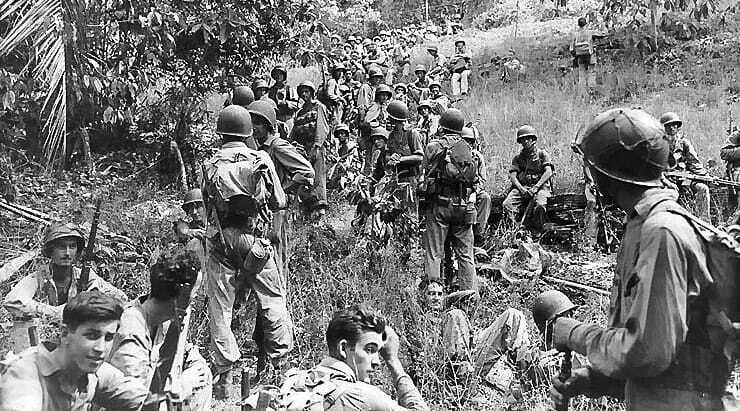 In battles across the Pacific during the span of the war some 161,000 Americans died with 248,000 wounded. The U.S. loss nearly 250 warships (including 11 carriers) and 21,255 aircraft. As horrific as the losses were for the U.S. Japan suffered the loss of some 2.1 million soldiers and civilians along with 341 warships and 45,125 aircraft. The dropping of atomic bombs on Hiroshima and Nagasaki brought the war to an end. The U.S. fought island to island in bloody fighting with the heavily entrenched Japanese who fought to the death for honor and emperor. The Japanese had gained control of large areas of the Pacific when they simultaneously attacked Malaya, Guam, Wake Island, Hong Kong and the Philippines on the same day they attacked Pearl Harbor. Through 1942 the Americans held on in the Pacific with hard fought naval battles against aircraft carriers in the Coral Sea and at Midway Island while the Japanese began planning attacks on Australia and Thailand. It would take nearly two years for the U.S. to ramp up their industrial might to battle both the Japanese in the Pacific and Germany in Europe. At the same time Japan lacked an adequate industrial base, pilot training programs and resources such as oil and steel to restock their losses. By 1943 the Allies had began the long movement across the Pacific seizing one Japanese island base after another. The Pearl Harbor Aviation Museum was founded in 1999 and resides in several historic hangars on Ford Island. Visitors to the museum gain access via a designated tour bus from the Pearl Harbor Visitor Center. 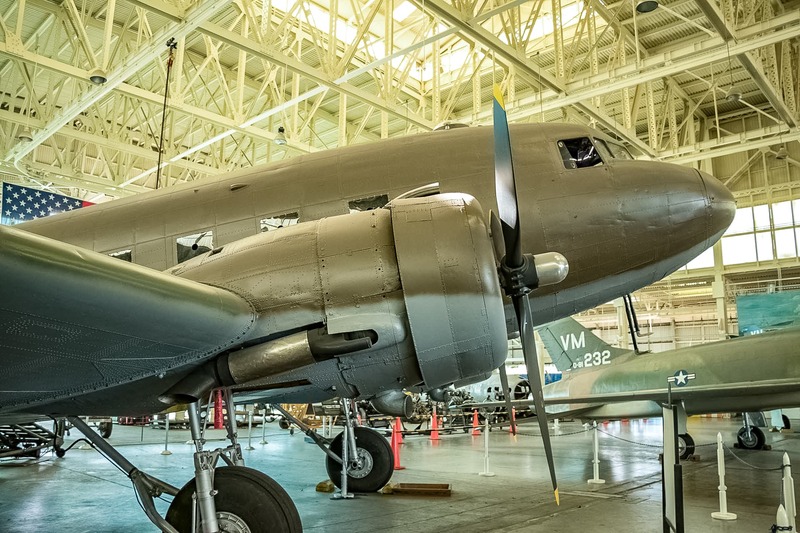 The museum opened on December 7th 2006 and hosts a variety of aviation exhibits including important planes and relics of the War in the Pacific. Much of the credit of creating an aviation museum at Ford Island goes to Hawaii’s Senator Daniel Inouye. Senator Inouye had been an elected representative of the state of Hawaii working in Washington D.C. for 58 years (before Hawaii was a state!) He died in 2012 at the age of 88. He was a staunch supporter of honoring the servicemen who fought in WWII and he had good reason to be. He was one of them! 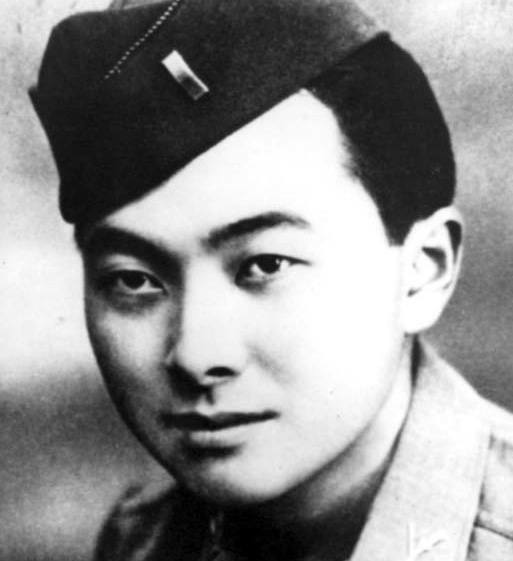 Inouye was an aid station volunteer during the Pearl Harbor attack and went on to fight in Italy in the infamous 442 Regiment were he lost his right arm. He received the Medal of Honor for his heroic battlefield actions. During his time as a senator he brought in funding for the Arizona Memorial in the 1960’s and was instrumental in championing the rebuilding and rebirth of Ford Island in 1999. 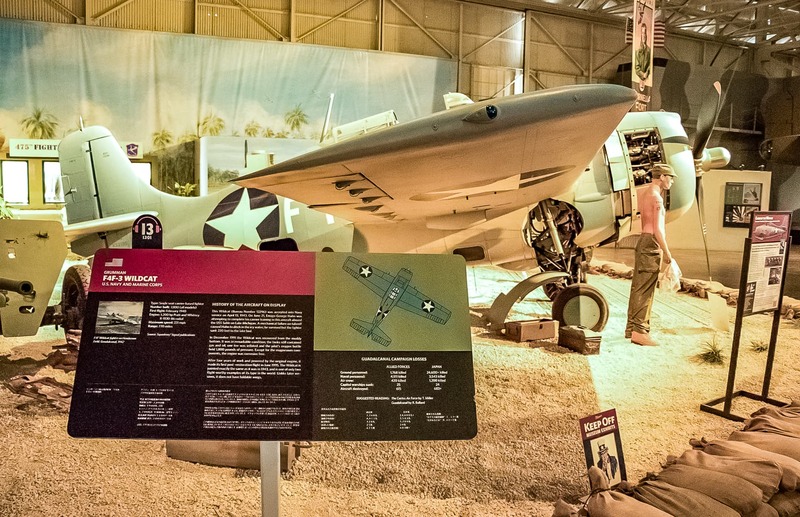 The first section of the museum, hangar 37, opened in 2006 and features a variety of aircraft exhibits with many relating directly to the attack on Pearl Harbor. 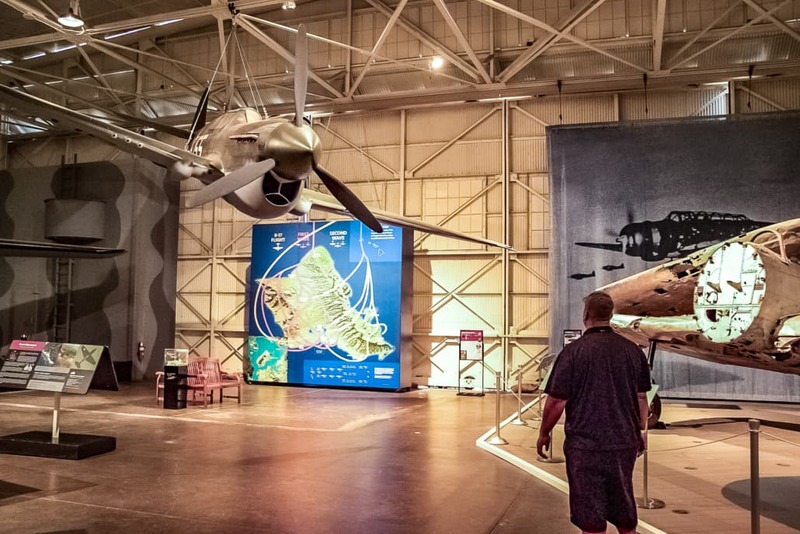 Hangar 79 features jet aircraft and the building shows bullet hole damage from the 1941 attack. 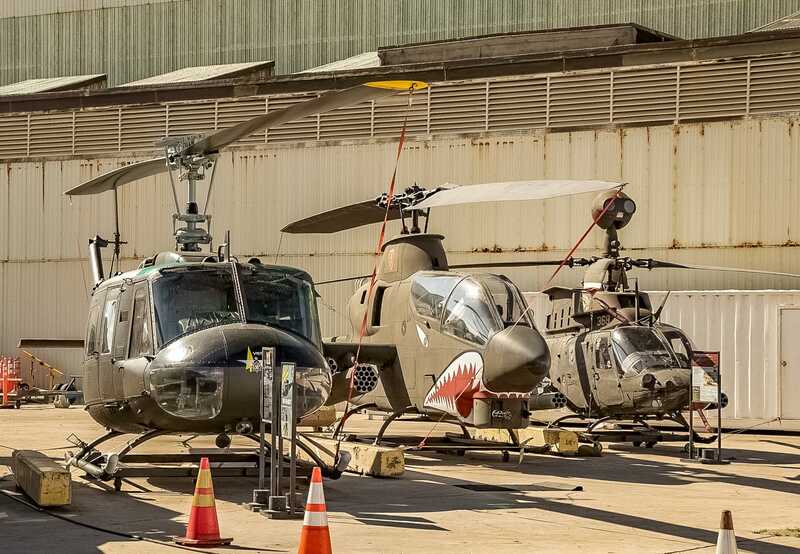 The museum grounds and hangars encompass 70 years of aviation history. Hangars 37 and 79 include over 50 aircraft and exhibits including many of WW2’s most famous fighters, bombers and transport aircraft used in the Pacific Theater of war. 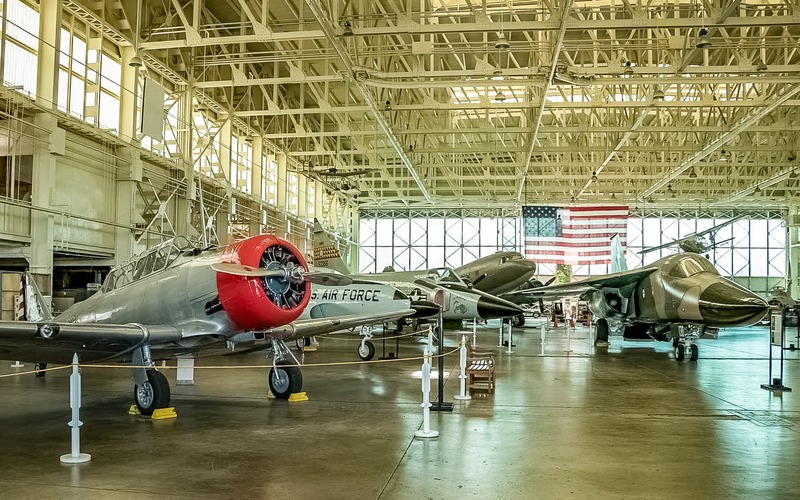 The museum also houses MiG Alley (fighter jets of the cold war) a Museum Store, the Laniakea cafe, flight simulators and beautifully painted murals of key battles in the Pacific. Historical videos can be viewed at several exhibits including the award winning Pearl Harbor documentary East Wind, Rain. 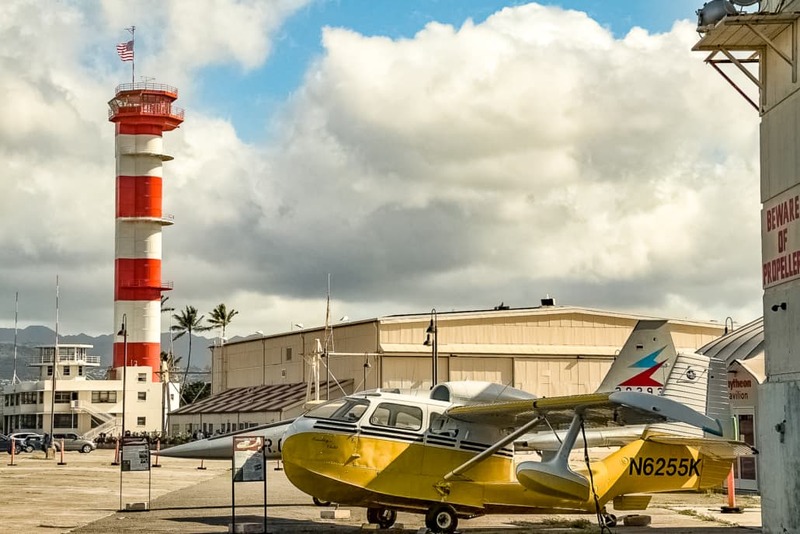 The museum has also received awards for their efforts in restoring historical buildings on Ford Island including the nearby runway control tower. Today Ford Island is still a Naval Base with restricted civilian access. 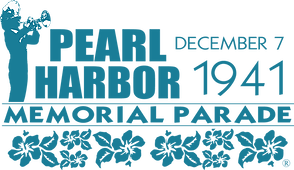 However visitors can access the island by tour bus originating from the Pearl Harbor Visitor Center. There are two museums on Ford Island; the USS Missouri Battleship floating museum and the hangars of the Pacific Aviation Museum. We splurged and got the Ambassador Package in order to get good seats for the luau. It was way worth it. We had a tour guide lead us through the islands. She took us from show to show. We wouldn’t have been able to see so much on our own. She took great photos of us and was so friendly. It was a fantastic day seeing so many wonderful performances. Highlights included the canoe pageant, the newly opened Cook Islands, and the luau which was delicious and entertaining. We also had a ukulele lesson which inspired us to buy one – they had lots of great ukuleles to choose from. The evening show Breath of Life was amazing. The show or the dinner is worth the price alone, but you get so much. I would highly recommend it. We did it at the beginning of our trip so we had jet lag and we were pretty tired. I would recommend you do it at least a few days after you arrive. If we had to do it again, I would definitely pick the twilight option and shorten the trip by 2 hours. And also pick the 6pm dinner instead of 4pm. That way you get there just in time to watch the boat parade, go around the islands and have dinner at 6 and the Breath of Life show at 7:30. Everyone in my family aged 10-65 all enjoyed ourselves! We purchased the Ambassador package which included a personal tour guide of the grounds, canoe ride, luau dinner and Ha-Breath of Life show. Although pricey it’s worth it. Our guide Pattica was great. He kept us on schedule to see most of the villages but allowed breaks for food and bathroom visits. Be sure to eat at one of the cafes at the front of the center before checking in because your meal doesn’t happen until 5pm! There were food booths at each country but to stay on schedule to see most of them you should bring some nonperishable snacks and bring plenty of water or at least a refillable bottle. There were plenty of water fountains around. Each village was beautifully landscaped and each of the hosts were proud to explain their culture to the visitors. I’m encouraged to visit the other islands for future vacations. It was really cool! My kids age 6 to 17 loved every minute. I’d suggest downloading the PCC app and using one of their agendas so you can experience as much as possible. There was so much to see. Everyone was warm and welcoming, plus it was a great education into the Polynesian culture. The Pearl Harbor Aviation Museum has been listed as the eighth top aviation attraction in the United States by TripAdvisor. The museum has won numerous awards for its preservation, rehabilitation and restoration of historic buildings and objects. Hangar 37 is a former seaplane hangar that was heavily damaged during the Japanese attack and was the first hangar developed for the museum. The building encompasses over 7 acres and houses nine aircraft exhibits, a movie theater, flight simulators, a gift shop and a restaurant. 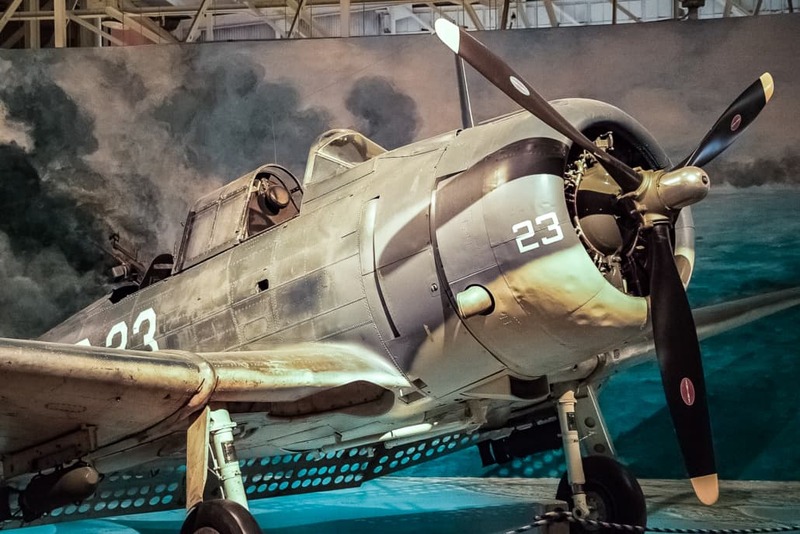 The exhibits in hangar 37 revolve around the WW2 aircraft used during the war in the Pacific and feature the carrier based Douglas SBD Dauntless dive bomber, the P-40 Warhawk fighter and the carrier based Grumman F4F Wildcat fighter. A Japanese Zero that crash landed after the Pearl Harbor attack on the island of Ni’ihau, east of Kauai, is displayed exactly as it was after the crash. 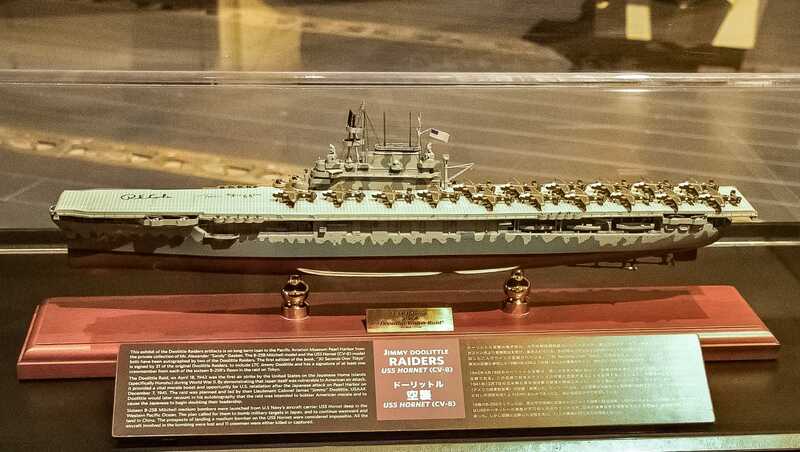 A 40 foot wide diorama of the Battle of Midway graces an entire wall along with a large maps and photographs of WW2 battles and aircraft. Other exhibits include the Boeing Stearman training aircraft used by former President George H.W. Bush for flight training and the infamous B-24 bomber used throughout the war in both the Pacific and European theaters of war. Hangar 79 is over 87,000 square feet and the buildings glass windows are still riddled with bullet holes from the day of the Japanese attack. 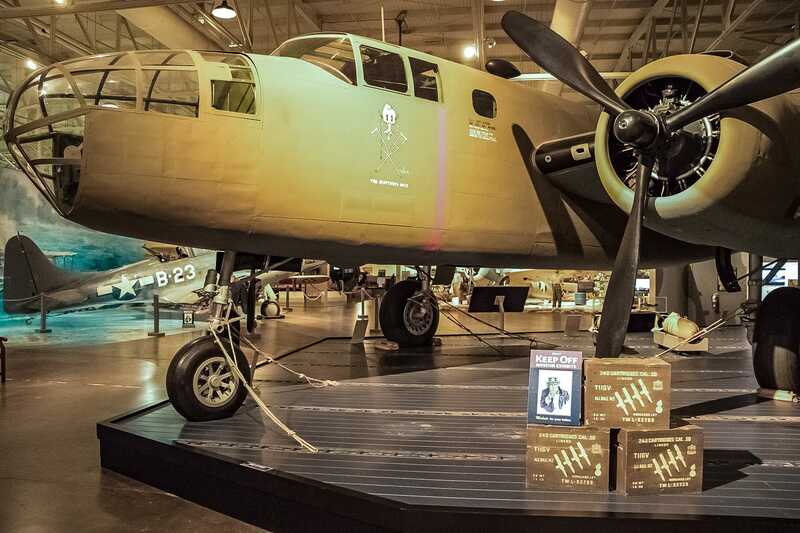 It contains exhibits which include the Flying Tigers, MiG Alley with its numerous jets, multiple military attack and transport helicopters and larger transport aircraft including the partial fuselage and nose of a B-29 Superfortress. A recovered B-17 Heavy Bomber that crash landed in a marsh near Rabaul in 1942 is also here. It was not successfully recovered until 2006, after 64 years in the marsh, earning the nickname “Swamp Ghost”. It arrived at the museum in 2011 where it was cleaned and reassembled and has become a centerpiece exhibit at Hangar 79. Just outside hanger 79 stands a lineup of helicopters and seaplanes overshadowed by the bright orange flight tower that has been restored to its former WW2 glory. The museum is open 7 days a week from 9am to 5pm. Admission is $25 adult and $12 for children ages 4 to 12. Children 3 and under are free. There is a discounted price if you book online so check that out first. A general admission ticket gives you access to hangars 37 and 79 and includes a self guided audio tour headset (in multiple languages). There are also military and resident (kama’aina) discounts available. There is also a guided visit option called the Aviator’s Tour. For $35 adult and $12 child an experienced pilot or aviation crew member will explain the history and aircraft in full detail. Included are visits to the Restoration Shop and a free gift upon arrival while supplies last. 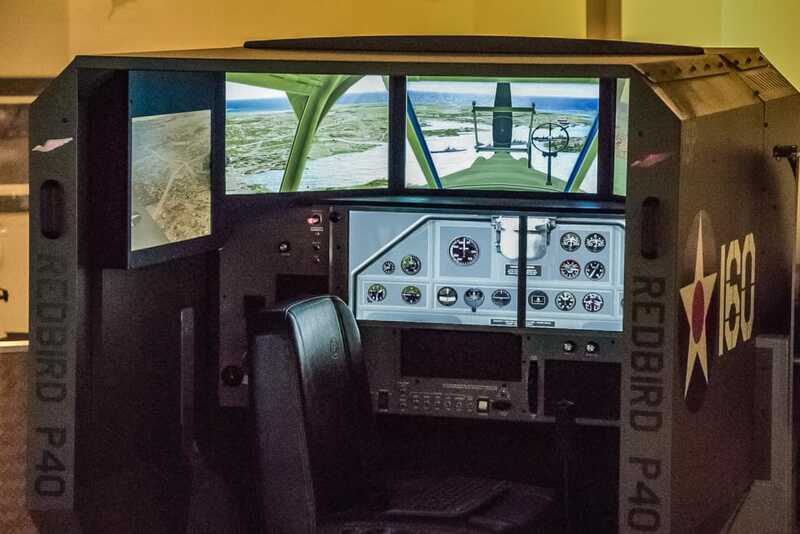 The flight simulators are an addition $10 which includes a 30 minute flight and briefing on the combat flight simulator. Pineapples have had an influence on our diets and even architecture. 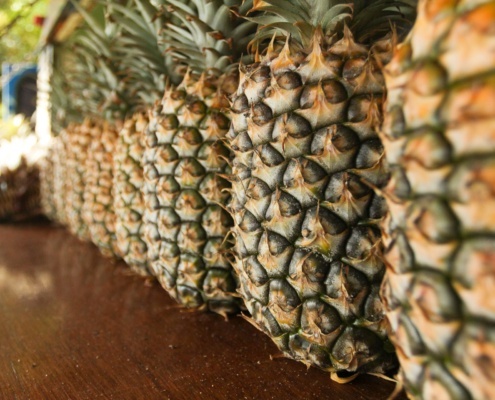 Learn all about pineapples from Hawaii and across the world. The founders, the growth and even varieties available today. Learn more at the Dole Plantation on Oahu or the Maui Pineapple Company on Maui. The first of many Pearl Harbor facts about the attack is that on the morning of December 7th, 1941, the Wickes-class destroyer USS Ward attacked and sank a Ko-hyoteki-class midget submarine near the entrance to the harbor, making it not only the first shot fired on that day, but the first official American shots in the War. As Polynesians continued to arrive in the Hawaiian islands from the south the native populations grew around the now expanding shallow lagoon. There is a rich and important history associated with this area both before, during and after the Japanese attack. 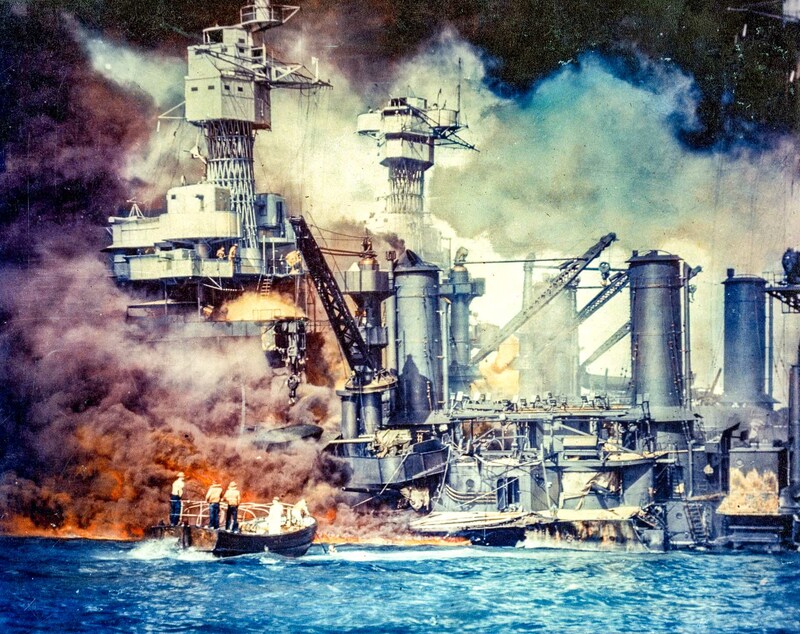 Here are just a few of the most interesting facts about Pearl Harbor you may not have known. 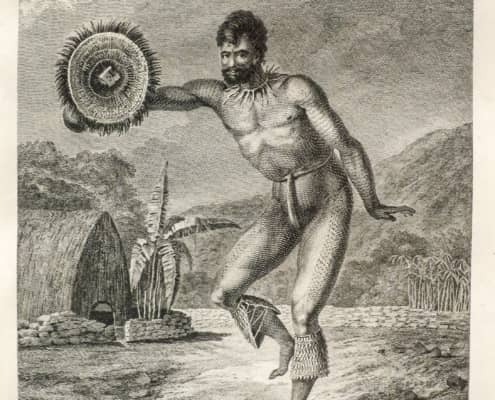 As Kamehameha battled for control of all the islands foreigners began to play a key role in his plans for a kingdom. In those days the Mo’i or King of an island was the absolute ruler. It was a sunny Sunday morning when, on December 7, 1941, the Imperial Japanese Air Force launched planes from 6 Japanese aircraft carriers North of Oahu. The rest is history.